I've heard the number 7% thrown around a bunch of times, but I am struggling to find reputable data to back it up. All I found was a quote from Warren Buffet that I couldn't find an original source for and data assembled by individuals on their personal websites. Is there something from an organization such as Market Watch making a statement about this? I'm hoping to specifically find what the 10 or 20 year return is for investing in the S&P 500 index fund or another diversified portfolio option. The oddly named MoneyChimp offers a great look at the numbers for the S&P. You can enter a date as early as 1871 and any ending date you wish. The last 100 years did, in fact, show a CAGR of 10.06%. Take off a bit, .05 - .10 for expenses if you want to see the return for an ETF or mutual fund. One way would be to take 1st March 2017 S&P 500 index value at close and take 1st March 2007 S&P 500 index value at close and calculate CAGR. Once such calculator is here. However, this will not be the exactly same as the returns of index funds for this period, since index funds can be managed passively or actively. For specific funds you probably have to look at the CAGR for the period for that fund. Not the answer you're looking for? Browse other questions tagged united-states stocks investing index-fund or ask your own question. 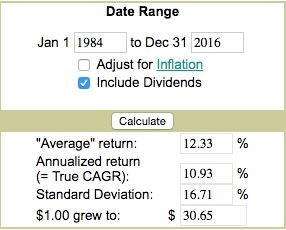 Is dividend factored into Annualized return? Should monthly return or annualized be used?